"Deja Vu all over again" as the great philosopher Yogi Berra once said. And to add, here's what the FAA said late today. Someone on the other drone pilot forum I follow just posted that earlier this morning. I'm not even in that area. No 20,000$ fine for me ! no-sir-re. Not that I'd fly in such a case. Well, we'll see if it pans out this time - I have my doubts. Like a tidal wave of emails ! Hurricane Michael made landfall this afternoon in the Florida Panhandle and continues through Georgia and northeastward into the Carolinas and into the Atlantic. We are in a holding pattern until tomorrow morning when the precursory damage overviews are performed with manned aircraft. After the initial assessments, we will have a better idea of scope and magnitude of sUAS operations. Communications with power, telecom, and utilities companies continue. We have been told to notify our pilots of the expectation to be "activated" (meaning placed on eitherstand-by or deployed) in phases (i.e. 10-20 approved pilots at a time). The pilots who reside closest to the affected areas will be activated first. YOU WILL BE CALLED IF/WHEN ACTIVATED.... Please, do not assume just because you are receiving this email, or if you drive to the area, you are activated. Hurricanes and their destruction are unpredictable; consequently, please be patient and we will provide updated information as it becomes available. ACTIVATED pilots will receive the Independent Contractors Agreement and W-9 forms for review and digital signatures via Docu-Sign. If you know of any Part 107 pilots who are not part of our network and are interested in being contacted as a potential Hurricane Michael response sUAS pilot, please have them either complete the form at https://www.tfaforms.com/4694848 or respond to this email to indicate your level of interest as well as your current location. If you have additional questions, please primarily utilize email; the preferred email address is PilotNetwork@SkySourceAerial.com (Sky Source Aerial is the service division of Florida Drone Supply). We are wishing everyone the best…and thank-you for your willingness to assist, if needed. Hurricane Michael made landfall yesterday with 155 mph winds in the Florida Panhandle and continued through Georgia and into the Carolinas and northward along the Mid-Atlantic seaboard. We have activated and deployed a limited number of pilots and are still waiting for the bulk of the precursory damage overviews are performed with manned aircraft. As you know, we will have a better idea of scope and magnitude of sUAS operations, after the manned aircraft ISR civil operations have been completed. Communications with telecom, and utilities companies continue. We have been told to notify our pilots of the expectation to be "activated" (meaning placed on either stand-by ordeployed) in phases (i.e. 10-20 approved pilots at a time). The pilots who reside closest to the affected areas will be activated first. YOU WILL BE CALLED IF/WHEN ACTIVATED.... Please, do not assume just because you are receiving this email, or if you drive to the area, you are activated. Hurricanes and their destruction are unpredictable; consequently, please be patient and we will provide updated information as it becomes available. Thank-you for your patience and continued willingness to assist, if needed. Hurricane Michael made landfall in the Florida Panhandle and continued through Georgia and into the Carolinas and northward along the Mid-Atlantic seaboard. We have activated and deployed a limited number of pilots; they evaluated many telecom towers and reported much destruction left behind from the storm. The recovery priority reports from the manned aircraft ISR civil operations, should be completed will hopefully allow more pilot deployments tomorrow. .
Communications with telecom, and utilities companies continue. We appreciate your patience and we will provide updated information as it becomes available. Just to keep you guys updated on what goes on. you probably see this already on the news. Even though we have activated and deployed a limited number of pilots, we are still waiting for the larger contracts from the Telecom companies. We personally flew manned aviation in the panhandle and Tallahassee region yesterday and witnessed, firsthand, poor communications, and more people evacuating. Many of the communications are limited to satellite phones. At least one of the mobile carriers is using tethered aerostat/UAS systems to provide portable mobile cellular sites. We appreciate your patience and we will provide updated information as it becomes available. We will continue to call pilots as they are activated and will receive the Independent Contractors Agreement and W-9 forms for review and digital signatures viaDocu-Sign. We continue to deploy a limited number of pilots for the Telecom companies. 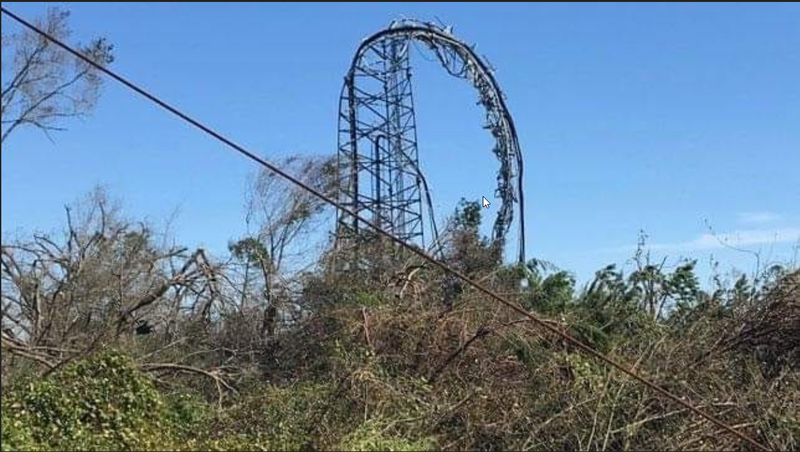 We have all seen media reports of the destruction caused by Hurricane Michael. Our pilot network team is routinely experiencing firsthand, poor communications, and limited access to the affected areas. We believe more pilots will be activated once the roads are passable, and Search and Rescue operations subside. Today several of our pilots were grounded today via VIP TFR due to POTUS, Governor, and other VIPs viewing the altered landscape via helicopters and other low flying aircraft. Below is a picture of one of the twisted assets one of our pilots captured. We will continue to call pilots as they are activated and will receive the Independent Contractors Agreement and W-9 forms for review and digital signatures via Docu-Sign.